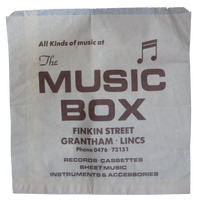 The Music Box was on Guildhall Street for a long time after it moved from Finkin Street. At both locations I seem to remember that downstairs was for instruments, sheet music and possibly Classical records and upstairs was for pop/rock records. They had very limited stock so it was rare that I ever bought anything from there but the bag image you have was the same design before and after the move (I think). If memory serves they opened some time in the early nineties and must have closed mid to late nineties.